It’s Saturday morning, and as you’re getting some cleaning done (and by “cleaning,” I mean binge-watching The Great British Baking Show on Netflix in your pajamas), you hear the dreaded knock on your door and peer out. Judging from their conservative clothes and the Watchtower magazines in hand, you quickly conclude you’re about to engage with some Jehovah’s Witnesses (JWs). You now have two choices: you can either ignore the knocking and pretend you aren’t home (but really, what kind of message does that send to your kids? ), or you can answer the door. My hope is that after you’ve read our articles on the Jehovah’s Witnesses (here and here), you will feel confident enough to engage in a conversation with them, but we also want to give you a bit more help in case you aren’t quite there yet. I know it can be daunting! Why are we preparing for this conversation? 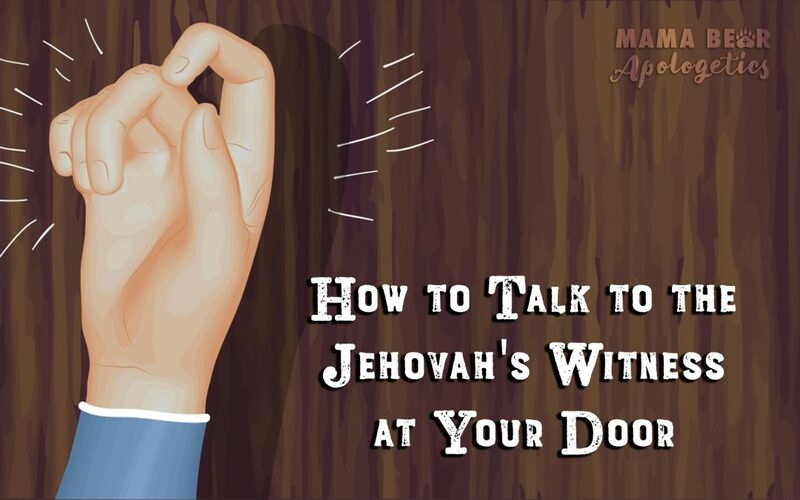 Did you know that Jehovah’s Witnesses prepare to talk to you? It’s true! They have classes at their weekly meetings to help develop their communication skills, and there is also written and online information available to them about how to engage with people about their faith. They also read a book called Reasoning from the Scriptures, which gives them answers to potential challenges like, “We are already Christians here,” “I’m not interested,” or even, “I’m a Muslim.”1Reasoning from the Scriptures (Brooklyn, NY: Watch Tower Bible and Tract Society of New York, Inc., 1985), 16-23. So, back to the JW classes…what do they learn at these classes? They are taught 1 Timothy 2:3-4, Acts 20:20, and 1 Peter 2:21 to encourage their members towards meaningful conversations with others about their beliefs. We should, too! Knowing that they are prepared before they knock on our doors tells us that we need to be prepared before we answer the door. It’s no fun getting steamrolled, overwhelmed, or tongue-tied. Jehovah’s Witnesses will ease themselves into the conversation by getting to know you. You should do the same thing! Just like Paul did in Acts 17, aim for common ground. Ask them how long they’ve been outside, and if it’s hot, offer them a glass of water. Take an interest in who they are. This will likely catch them off-guard since many times either no one answers the door or, if the door is answered, it’s quickly closed in their faces. Rude…don’t be that person. So, what should you say when they start presenting their “Good News?” Nothing…at first. The first thing you should do is listen closely to what they have to say. Take note of any Scripture they cite. If it seems like the conversation is going somewhere, offer them a chair and sit with them. This is your opportunity to show them that not all Christians are hostile toward JWs. They may have never met someone like that. This is your chance to be the light. If they give you a copy of The Watchtower Magazine or Awake!, it would be gracious to accept it (but you don’t have to keep it forever). This article really covers two different phases: the relationship-building stage and the established relationship stage. Cynthia said that one thing they are taught is that they are the teachers, so if the person they are talking with seems to be trying to teach them, they are likely to walk away from the conversation and not come back. In other words, tread lightly, go slowly, be patient, and be a student. • Ask them how they know that the Watch Tower Society teaches the truth. Ask them what steps they took to determine if the Watch Tower Society was telling the truth. Listen to what they say. They likely have not done any independent research into their own religion. This isn’t a question designed to trap them, but a question to get them thinking about why they believe what they believe, which I think all believers of anything should do. • You could also ask them what it means to call their organization “the truth.” You could then ask them to read John 14:6 where Jesus says that He is the way, the truth, and the life. Ask them what they think this verse means. If Jesus is truth, how could an organization created by a man (Charles Taze Russell) be truth? • Ask them when their church was founded. Ask them if God was without a witness before the start of their church because they claim that they are the only true witnesses of Jehovah. If He was without a witness for thousands of years, did God truly care for His people? Front door conversations are likely going to be pretty short, so quick questions like the ones I mentioned above would be appropriate. Often, it is good to schedule a follow up meeting, which will give you time to research anything that they said that made you go “hmmm…” But, what about when you have known the JW for a long time? Think of it this way: you normally don’t talk about religion and politics on the first (or even second or third) time meeting someone, do you? Why do you think those topics come up so regularly at Thanksgiving dinner, when the family all gets together? It’s because relationship and (ideally) mutual love and respect are common prerequisites for those types of conversations. Those kinds of conversations are like the “deep end” of a pool. You wouldn’t throw a child into the deep end if they have never learned how to swim, right? No, first, you give them floaties and let them wade in the shallow end. Then, you guide them into the deeper end of the pool, slowly and cautiously. As they begin to understand how swimming works and have a healthy respect for water, they gain more confidence and trust. Then, and only then, will they begin to swim on their own. So, when you have a JW at your door, it’s like your opportunity to give them floaties. Take it slow. Once you trust each other and have a solid relationship, then you can begin to talk about the topics below. If you’re there, and you’re ready, well, shoot… let’s dive in and talk about Jesus! • Jesus is just another created being (Michael the Archangel, to be more specific). Jehovah’s Witnesses might tell you that Jesus is not God. They may not directly come out and say that Jesus was Michael, so be prepared if they don’t. They will likely use Scripture to support their views (such as, Colossians 1:16 and John 14:28). Remember, JWs use their own version of the Bible, called the New World Translation. Be on the lookout for language that demotes Jesus from the Godhead. In my last article, we tackled Colossians 1:16, so I won’t address it here, but let’s talk about John 14:28. John 14:28 says, “the Father is greater than I,” something that makes JWs believe that Jesus is less than the Father. Don’t fall for this! o Response: Ask them what they think the context is for Jesus making this statement. Ask them if you can read Philippians 2:2-6 together. In this passage, Jesus talks about how he took upon the form of a servant but was also in the form of God. See if they understand the implications (i.e., He was God, but He was serving). Ask them if you could also read Hebrews 2:9 together. This passage describes how Christ was made lower than the angels but now crowned with glory so that He could usher in God’s grace through His death and resurrection. Discuss the implications of Hebrews 2:9 (i.e., Jesus is God who became flesh so that He could serve us by dying on the cross and rising again). Both of these passages should help explain that Jesus, God the Son, is not lower than God but is God. • Jesus only had “divine qualities” but was not himself divine. This is where it’s helpful to know what their Bible says (New World Translation or NWT) versus other Bible versions. Colossians 2:9 in the NWT says, “It is in him that all the fullness of the divine quality dwells bodily.” My Bible, which is the New American Standard, says, “For in Him all the fullness of the Deity dwells in bodily form.” See how those two verses say something different? In the NWT, “divine quality” replaces the word “Deity.” The text has been changed in the NWT because Jehovah’s Witnesses do not want it to appear like Jesus is God, but that he simply had “godlike qualities.”4For an excellent and thorough discussion on this point, see Ron Rhodes, Reasoning from the Scriptures with the Jehovah’s Witnesses (Eugene, OR: Harvest House, 2009), 79-81. • Jesus is only partially sufficient for salvation. According to JWs, salvation is only available through works and faith in Christ is not enough for salvation. They will agree that the Bible says eternal life is a gift from God through Jesus Christ (which is consistent with Ephesians 2:8-9). So how can it be both a free gift and based on works? It seems like they are speaking through two sides of their mouth. For JWs, salvation is a gift, but works are required, as well. Ron Rhodes explains, “Bordering on playing semantics games, Jehovah’s Witnesses affirm that while good works do not earn salvation, they are nevertheless prerequisites for salvation.”5Ron Rhodes, Reasoning from the Scriptures with the Jehovah’s Witnesses (Eugene, OR: Harvest House, 2009), 283. One might think of it like applying for a scholarship. Applying for a scholarship doesn’t earn you a scholarship, but it is a prerequisite for the scholarship. The scholarship is a free gift, but to receive it, one must do certain things to become eligible. o Response: First, ask them what they believe. Tell them that almost 200 times in the New Testament, salvation is given through faith alone.6Ron Rhodes, Reasoning from the Scriptures with the Jehovah’s Witnesses (Eugene, OR: Harvest House, 2009), 293. You could share Acts 16:31, John 11:25, Titus 3:5, and Galatians 2:16. After reading these verses with them, ask them if this sounds like what they know about salvation. o Response #2: Ask them if they know the difference between salvation and sanctification? Let them know that you believe that good works are a part of who we are as Christians, but that those works are not required for salvation. Rather, these works are part of sanctification, where we are made increasingly into God’s likeness. Yes, we should do good works because we are followers of Christ, but faith alone is what saves us. Our good works are an outpouring of who we are in Christ. The Trinity. We talked extensively about what Christians believe about the Trinity here, and we briefly covered what JWs believe here. For this topic, it’s particularly important that you study up because Jehovah’s Witnesses are thoroughly trained on how to respond to this issue. Be warned, though—this topic can be exceptionally tough because it is something that is difficult to explain, even for Christians. When we covered the Trinity in our article about Christianity, I wrote about all of the dangers of our attempts to illustrate the Trinity with analogies (which typically lead to heresies like modalism, which is what Jehovah’s Witnesses tend to think all Christians succumb to when teaching about the Trinity). In other words, you’ll want to be careful when tackling this tricky issue. And again, do not bring this up until you have sufficiently established a trusting relationship! • The word “Trinity” is not in the Bible. This one is a pretty common argument against the Trinity by Jehovah’s Witnesses. While this is technically true (the word is never mentioned), the concept of the trinity is well established, as we’ll explain below. The JW might bolster their argument by also noting that the word “Trinity” was developed gradually over centuries and first fully revealed in the 4th Century, and they’ll use the New Encyclopedia Britannica and other sources to support their claims.7Reasoning from the Scriptures (Brooklyn, NY: Watch Tower Bible and Tract Society of New York, 1985), 405.
o Response: If we are ignoring things that aren’t explicitly stated in the Bible, you can respond by mentioning that the word “Jehovah” is not in the original text, either. In fact, it doesn’t appear till the 16th century. It’s a made-up word because scribes were careful to never speak the name of the Lord. To prevent the accidental saying of God’s name (Yahweh – which looked like YHWH) out loud, they added the vowels from Adonai in between the consonants of Yahweh, and…well, just watch this short little video. It’s probably easier to watch it rather than to have me try to explain it here. • The Trinity is pagan. Jehovah’s Witnesses might also tell you that the Trinity is a pagan concept. o Response: It’s important to point out to them that the pagans were polytheists not monotheists, which means that they believed in several distinct gods.8Ron Rhodes, Reasoning from the Scriptures with the Jehovah’s Witnesses (Eugene, OR: Harvest House, 2009), 222. Clarify that Christians believe in one God with three persons. o Counter-Response #2: Ask them if we can reasonably expect to understand everything about God? If they say anything remotely close to a “yes,” again cite from Reasoning from the Scriptures: “Should we really expect to understand everything about a Person who is so great that He could bring into existence the universe, with all its intricate design and stupendous size?”10Reasoning from the Scriptures (Brooklyn, NY: Watch Tower Bible and Tract Society of New York, 1985), 149. According to their own material, we should not expect to understand all the ways of God, and not understanding something is not grounds for rejecting it. Eschatology. JWs believe that only 144,000 people get to Heaven (the “anointed class” or “little flock”), and that those people were already determined by 1935.11“Have No Fear, Little Flock,” https://wol.jw.org/en/wol/d/r1/lp-e/1995124#h=1:0-12:1082 (last accessed Sept. 30, 2018). This is also a bit more complex than it seems. In 2007, the Watch Tower Society issued a response to a reader, noting, “As time has gone by, some Christians baptized after 1935 have had witness borne to them that they have the heavenly hope. (Romans 8:16, 17) Thus, it appears that we cannot set a specific date for when the calling of Christians to the heavenly hope ends.” [https://www.jw.org/en/publications/magazines/w20070501/Questions-From-Readers/] In other words, even though many in the church still hold to the 1935 cutoff date, there is an opening for others to be added to the “little flock.” Any other true believer (a JW) is part of the “great multitude” or “other flock,” and will live in earthly paradise for all of eternity. • The “anointed class” is limited to 144,000. When you talk about the anointed class, ask the Jehovah’s Witness if there is anywhere in the Bible where Heaven is explicitly limited to just 144,000. They will likely respond with Revelation 7 and 14 (which both talk about 144,000 people), but they won’t be able to show you a verse that specifically limits those who go to heaven to just 144,000.
o Response #1: You could also read 1 John 5:1 to them, which says, “Everyone who believes that Jesus is the Christ has been born of God.” The word “everyone” would seem to include not just 144,000. Other verses that talk about all who believe (not just the 144,000) include Ephesians 2:19, Galatians 3:29, James 2:5, and John 12:26.
o Response #2: Another interesting question you could ask is whether the anointed class (the 144,000) includes women. They will likely say yes, but then point out that Revelation 14:4 clearly states that the 144,000 are “men who have not been defiled by women.” That seems to indicate that women are not included in the 144,000 mentioned in Scripture. o Response #3: Ask them to read John 10:16. Jesus says, “I have other sheep that are not of this sheep pen. I must bring them also.” (Here, Jesus is referring to the Gentiles that he is going to bring into the fold.) He continues, “They too will listen to my voice, and there shall be one flock and one shepherd.” If we are one flock with one shepherd, why would we be divided in eternity? New Light. New light is how Jehovah’s Witnesses explain changes in the Watch Tower Society’s views…claiming that the “light gets brighter” in order to justify the changes. There’s a pretty good explanation of it in this 16-minute video from Witness for Jesus, an organization created to help JWs and former-JWs think more deeply about the Bible. o Response: Ask the JWs at your door about John 8:12, which says, “When Jesus spoke again to the people, he said, ‘I am the light of the world. Whoever follows me will never walk in darkness but will have the light of life.’” Ask them how an organization can claim to have new light when Jesus is the light of the world. Truth doesn’t change. 1. Be kind. JWs are taught that Christians are hostile towards them and they interpret rudeness or hostility as proof that they are being persecuted for God. Find common ground, and don’t degrade or belittle them. Instead, find a way to share the truth with them with gentleness and respect (1 Peter 3:15). 2. Be prepared. Keep any Watchtower or Reasoning from the Scriptures material available and highlighted for easy finding. In fact, why not have a copy of this article on a shelf next to the door, just in case? Understand a bit of their church’s history, as well as the basics of their beliefs. Even if you are using this knowledge to ask questions, it’s wise to know where they are coming from. 3. Be patient. Don’t aim for a full expose on JW heresy on the first visit. The goal is a second visit! Do not expect that every conversation you have will result in a conversion, either. My friend, Chris, once told me that we’re aiming to plant seeds, not weeds. What you say may have an impact, but you may not see it come to fruition during your time with them. That’s why it’s essential that you’re prepared to engage in a fruitful dialogue instead of a judgmental diatribe. You may only get one shot to plant a seed, and you really don’t want to miss out on that opportunity. For further reading, I definitely recommend Reasoning from the Scriptures with the Jehovah’s Witnesses by Ron Rhodes (there’s a revised 2009 edition available). It’s a thorough book that walks through the key theological issues that may come up in your conversations with Jehovah’s Witnesses. It’s also accessible in the sense that you don’t have to have a theology degree to understand it. You may also want to read the Watch Tower Society’s book, Reasoning from the Scriptures, to get a better idea of how Jehovah’s Witnesses prepare to engage in conversations and what they are taught. There is also detailed information about their beliefs on their Website at www.JW.org. Thank you to former Jehovah’s Witness, Cynthia Velasco Hampton, for reading my JW articles to ensure that what they contained was accurate. Your insight has been invaluable. Love your article. Wish I had read this before they stopped by my house this past weekend. They stopped by to ” Evangelize” and whiles they were ministering to me the Holy Spirit revealed to me Through the word of knowledge that one of them had a family member suffering from cancer. I asked him and he confirmed it. God asked me to pray for him and was horrified when they objected because they did not believe that Jesus is lord and they also did not believe in praying in public. I pray that God will open the eyes of their understanding. I grew up beside a family of JW’s. They never pressured or preached to us. They were always there when we had family emergencies. My parents never worried about us when we played with their children. If you look up DEFINITION of CULT, it doesnt fit JW’s. So many things that the world does today is steeped in pagan beliefs. The bible does say, Be no part of the World and my people will be hated as my Son was has on account of my name. Most people dont care for the belief of JW’s because they dont go along with traditions that are man made. Ive researched on my own for years what they and other faiths teach. I found that they do and live and teach, all comes from the Bible, not man made or taught. They follow the example Jesus set, that his father sent him here to do. They strive to live clean away from lies, trickery with words and justifying wrong doing. Who would want to be a JW? It would not be a easy life in todays world, would it? Geez, I would rather dig ditches. I ask my friend, wouldnt you rather sleep in on Saturdays? He said , YES! I would but God and his Son ask us to go just as Jesus walked everywhere and speak to peope. Look how Jesus and appstles were treated…. arent JW’s treated ghe same? People make up stories and even lie on them. They hurt no one, they dont try to stop others from their beliefs. They are treated rudly and even shoved at peoples door, but they keep going. What benefit do they get, personally? Their spare time, gas, weekends, why not sleep in or cookout? I think they are very kind and driven people. Reading your article and commenting, its made me want to atted a Hall and find what drives these people and I need to be kinder, patient and find some peace that they seem to have.. Thanks for reading and for submitting a comment. We do not deny that JWs may be kind and thoughtful. Indeed, in my interactions with them, they have always been nice to me. That said, niceness doesn’t have any bearing on whether a worldview is true. The intent of our articles about the JWs is not to attack them (we have even discussed things we can learn from them, like piety and evangelism), but to compare what they teach with the Bible and Christianity. For example, JWs do not believe that Jesus was God in human form (a fundamental Christian belief), and they reject the idea of the Trinity (another fundamental Christian belief), too. JWs also reject all translations of the Bible except for their own (the NWT). Again, I’m not saying that JWs aren’t kind or generous, but their worldview is something that should be looked at because their truth claims do not often line up with the Bible. Thank you, again, for commenting, Josie. I appreciate that you took the time to do so. P.S. 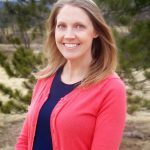 If you haven’t read my first article on the JWs (https://mamabearapologetics.com/what-jehovahs-witnesses-believe/), or the Q and A I shared about their worldview (https://mamabearapologetics.com/jehovahs-witnesses-questions-and-answers/), I encourage you to take a look at them as they may help clarify some things for you. Hi Josie, I appreciate your comments and I know that many, many JWs are very nice people. After all, I had been one too. My mom started taking me to the Kingdom Hall when I was 13 when she started studying, and I got baptized at 16. I left when I was 24. I considered myself to be a nice, caring person. (And I still am! J) My mother was always nice to her neighbors too and the kind of person who would bring you soup if you were sick. I am not sure what your definition of a cult is. Some people believe in a definition that only applies to those who are sequestered inside a compound or commune. Certainly the Fundamentalist Latter Day Saints (Polygamous Mormons) do fit this definition. Other cults allow their members to live normally, but they monitor their members very closely and have them coming to their meetings nearly every day and require reports from them. I believe that the JWs still have to turn in reports on how much time they have spent in their preaching work. This determines whether or not a person is considered active or inactive. Behavior Control: Clothing styles, as one is dictated what one can wear to meetings, restrictive or makes one feel guilt over leisure activities, rather than spending more time in service to the organization; also dictates the type of medication treatment one can have (with JWs, no blood); also demands complete obedience to the group’s rules. Information Control: Forbidding from speaking with former members, forbids access to information that is critical of the group, members are required to report their thoughts, feelings, and activities to their elders/superiors; encourages other members to spy and report on others’ misconduct. Emotional Control: Irrational fears about leaving or questioning the group. (such as thoughts of dying in Armageddon). Showers new recruits with love and praise, but if a member leaves, they are shunned. Teaches that there is no happiness outside the organization. Labels doubt as a sin and labels some emotions as evil, worldly, and wrong. Certainly people have the freedom to join any kind of group they want, but there should be freedom to leave the group without repercussions. One should be able to leave and attend another church without being labeled as an “apostate” and warning other members to shun and avoid that person at all costs. Families should not be forced to shun their daughters, sons, mothers, fathers, brothers and sisters, just because they decide they no longer believe in the organization’s teachings. Is that what Jesus taught His followers to do? You mentioned how JWs avoid pagan beliefs. So why do JWs still use the calendar with all the pagan gods named for the months, as well as the pagan gods named for the days of the week? Why do they use wedding rings? Wedding rings definitely came from pagan beliefs. You also mentioned that you have done your own research. Can you please tell me what books you have read regarding what other faiths teach?